APS second grader shows her artwork that was displayed at the State Superintendent's Exhibit in Montgomery. 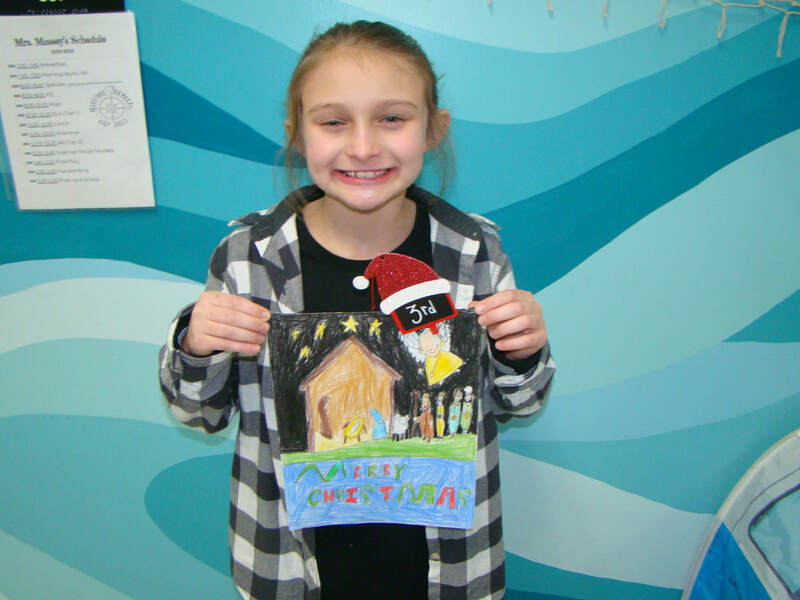 APS second grader shows her artwork that won 3rd Place in her division at the Mountain Valley Arts Council Christmas Card Contest. Second graders have been learning about the various materials that can be used to make sculpture. They also examined a work by Miriam Schapiro and Edgar Degas to see dancers in motion or caught in a moment. Artists' styles were discussed. Students also looked at a soft sculpture by Oldenburg. The tiny dancers were made from recycled grocery bags among other soft items. Students enjoyed the process. After complete, students were able to go "shopping" for tunics and belts for their figurine. Many student artists used their creations in a puppet show to entertain us! Check out our ARTS Theater. Go to artblogwithramonahall.weebly.com to see a puppet show. Thanks goes to Tammie Clark for teaching us how to make the soft sculptures at the AAEA conference. 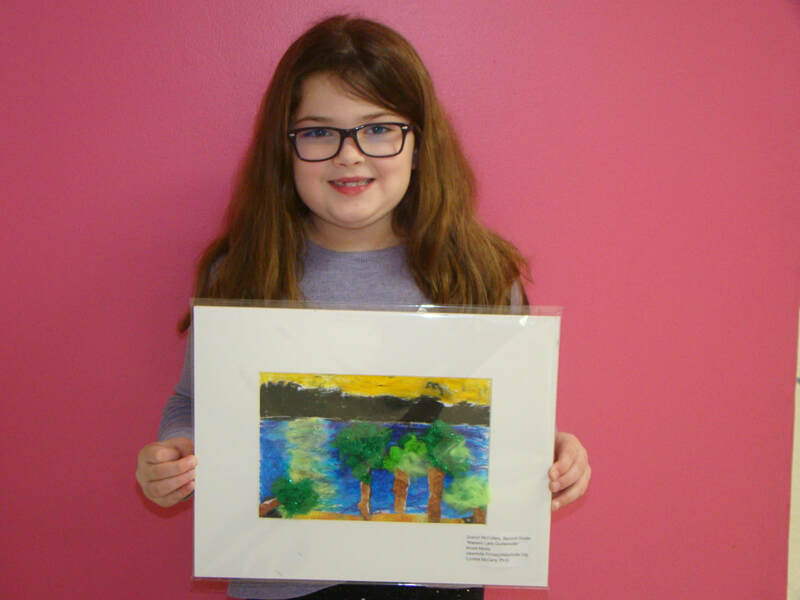 Albertville Primary School had seven entries in the All County Student Art Show sponsored by the group A.R.T.S. A reception was held at the Guntersville Museum to honor all students that had their work in this exhibit. Several of our students received awards for their work. Inspired by the work of American glass artist--Dale Chihuly, Albertville Primary School first and second grade students along with teachers and parents worked collaboratively to design these interesting sculptures before, during and after our "Night of the Arts." A special thanks to Mary Jane Coker for her Chihuly presentation at the AAEA conference. Many of our first and second grade artists have been learning about French artists--Henri Matisse and Paul Cezanne. After discussions on two still life works by these Master artists, students observed a still life set-up of apples in our art room. Students used their "artists eyes" to draw the apples and then they finished their work in chalk pastels or tempera paint. Albertville Primary hosted two "Night of the Arts" celebrations on Monday and Tuesday night. Students and their families were invited to see the art on display in the lobby gallery and classrooms; as well as, create some art at art stations. The event concluded with students singing patriotic songs on stage for their family and friends. Observing an array of bakery cupcakes in the art room, second graders drew and chalk colored their own versions of the delicious sweet.